Wayne Herschel has cleverly identified the eight stars in the rim of diagram A as parts of the Pleiades constellation. On his website, Herschel explains in great detail how the Pleiades can be constructed from these stars. His explanation is rather complex and involves the joining of the stars with a jump in the sequence for star number ‘6’ and removing the pencil from the paper not once, but twice! According to Herschel, star number 6 is a ‘lost’ star of the Pleiades constellation that is no longer visible in our present time. Aaron Parlier has worked out a far simpler and more logical rendition of the Pleiades star cluster. His solution requires neither a jump in the sequence nor does it involve removing the pencil from the paper. Also, Parlier’s rendition does not account for an irregularity with any ‘lost’ star. 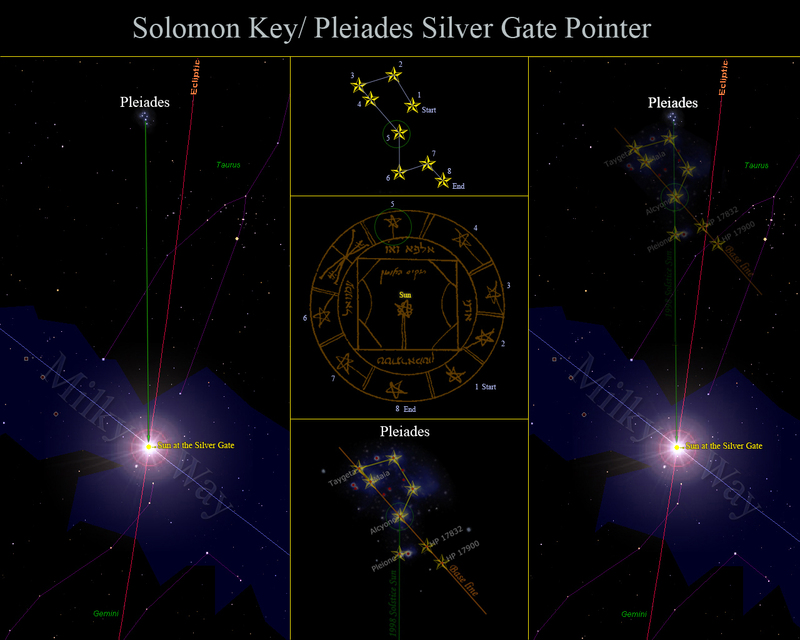 The Pleiades in the Key of Solomon form the pointer to the Silver Gate, the place of the Sun during a Great Celestial Conjunction at an Equinox or Solstice. Starting at position 1 in the rim the stars are assembled by, as Herschel states, ‘binding’ them. Each star has a beam protruding from it and when these beams are connected in a counter clockwise direction starting with star 1 in exactly the same layout as they occur in the diagram, the Pleiades star cluster is formed. The beam of star number 5 is pointing downwards exactly in the direction of the Silver Gate. The Pleiades template in the picture above is exactly the same template that has been tested on Stonehenge whereas the star map was pointing to the Summer Solstice Sun on the Silver Gate at the current Great Celestial Conjunction (summer solstice 1998). Diagram A in the Key of Solomon symbolizes a Great Celestial Conjunction (8-pointed cross) during an Equinox (double cross bars in the 8-pointed cross and Equinox Sun in the central square). The diagram may therefore refer to the last Great Celestial Conjunction when the vernal equinox was in the Gate of Silver! This amounts to 25,920 (years in a Great Year)/4 = 6480 years ago. That equates to +/- 4482 B.C. and is roughly the same year as encoded in the Palette of Narmar.